Barbecuing is not what it used to be. When growing up the only time that my family would start up the grill or smoker was in the summer and on the weekends. Today, people barbecue every night and all year round. Barbecue sauces have come along way since then as well. There used to be only a couple of choices at your local market. But now with the invention of “super” markets the amount barbecue sauces you can buy locally has grown significantly. For those gourmet barbecue sauces the web is probably the only place you will find these unique sauces. 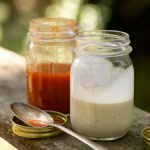 If you don’t live in the Alabama area the only place you will find traditional White BBQ Sauce like Big Bob Gibson’s is on the web or of course you can try to make it yourself. In Alabama Barbecue traditional Sauce uses Mayonnaise as its base rather than tomato sauce, vinegar, or any of the other more typical barbecue sauce bases. It is clearly a region favorite. Bob Gibson of Decatur, Alabama is credited with the invention the white sauce back in 1925. Friends and family were first treated to this secret-recipe sauce on chicken and pork at weekend barbecues where boards were nailed to trees for tables. Today, this famous mayonnaise-based condiment is traditionally employed to baste chicken, seafood and pork. White BBQ Sauce is as synonymous with the state with Alabama as the legendary “BAMA” football program. White BBQ Sauce’s intriguing flavor complements salads and is a superb baste for chicken, pork and turkey. You can also use White Sauce as an ingredient to add an extra kick to your favorite slaw or potato salad. However, because the racks of your local grocer are dominated by many incarnations of tomato-based sauces and white bbq sauce is such a regional anomaly, most people outside Alabama have not tested this concoction of flavor. Like many barbecue sauces you want to apply this only at the very end of your grilling or smoking. It will breakdown and separate if it is heated too long. Use this sauce on chicken and turkey. It is also good on pork. 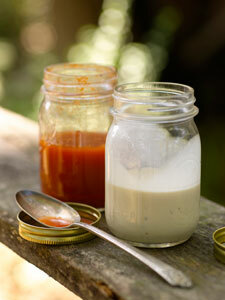 Alabama White Barbecue Sauce has a tangy flavor that is a great addition to grilled foods. White BBQ Sauce makes a unique experience. Use this recipe when grilling chicken; brush lightly over the chicken during the last few minutes of grilling. This sauce is also great for dipping; keep some sauce aside for passing at the table. Place all ingredients in a very large blender or food processor. Blend for 1 minute, or until thoroughly mixed and sauce is smooth. Pour sauce into a large container or bowl. Is a blender or food processor necessary? It seems this could be mixed in the bowl, as long as you started with the corn syrup and thinned it with the lemon juice or some vinegar. I just hate washing extra dishes. Probably just a slight difference in texture otherwise shouldn’t matter. Wow this white barbecue sauce is new to me. My barbecue sauces are always red. Thanks for sharing this. I’ll try this out. I want more people would write blogs like this that are really helpful for people. With all the fluff floating around on the internet, it is a great change of step to read a blog like yours instead. I never knew there’s a white sauce for a barbecue. My girlfriend’s mom will be visiting this weekend, I’m gonna impress her with this. Thanks a bunch! This will go great with some craft beer! I will be sure and make a recipe just for pairing it with a good craft beer or home brew. Thanks! Love the history behind the white bbq sauce. Very interesting. Also have to give the sauce a try as people in those areas tend to know a thing or two when it comes to bbq’ing. Thanks! Nice recipe. Thanks for sharing. I use a similar recipe but I also add in a pinch of fresh mint – it compliments the lemon juice really well. sounds like a nice touch! appreciate it. White BBQ sauce is always my favorite, nice recipe!